The United Nations Children's Fund (UNICEF) is celebrating the release of some 3,000 South Sudanese child soldiers today in what is being hailed as one of the largest ever demobilizations of children in a zone of conflict. An initial group of 280 children – ranging from 11 to 17 years of age – were released by the South Sudan Democratic Army (SSDA) Cobra Faction at the village of Gumuruk in South Sudan's eastern Jonglei State. The release was marked by a ceremony overseen by UNICEF and the South Sudan National Disarmament, Demobilization and Reintegration Commission during which the child soldiers reportedly surrendered their weapons and uniforms. Further phased releases of the other children are planned over the coming month. The security situation in South Sudan deteriorated steadily over the past year since political in-fighting between South Sudan's President Salva Kiir and his former deputy, Riek Machar, started in mid-December 2013. The hostilities subsequently turned into a full-fledged conflict that has sent nearly 100,000 civilians fleeing to UNMISS bases around the country. The crisis has uprooted an estimated 1.9 million people and placed more than 7 million at risk of hunger and disease. In its press release, UNICEF explained that it is currently working to trace and reunify the children with their families, a “daunting” task due to the more than 1 million children who have either been displaced internally or have fled to neighbouring countries since fighting broke out. In the meantime, the UN agency is supporting the former child soldiers with basic health care and protection services and necessities such as food, water and clothing to help them get ready to return to their families. Moreover, counselling and other psychological support programmes are urgently being established as well as access to education and skills training programmes. Mr. Veitch warned, however, that the successful application of such programmes demanded significant resources. UNICEF, in fact, estimates the costs for the release and reintegration of each child at $2,330 for a two-year period. Although some funding has been forthcoming, the agency is appealing for an additional $10 million. 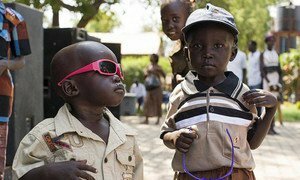 South Sudan is one of seven countries highlighted in the UN's ongoing “Children, Not Soldiers” campaign which aims to end the recruitment and use of children by Government armed forces in conflict by the end of 2016. During the Special Representative's visit to South Sudan in June 2014, the Government recommitted to the full implementation of its action plan with the United Nations to end the recruitment and use of children in the Sudan People's Liberation Army. In May, Riek Machar, signed a commitment with the Special Representative to end all grave violations against children. The conflict in South Sudan has seriously hampered the protection of children, increasing their vulnerability dramatically, says a new report published this week by United Nations Secretary-General Ban Ki-moon.